Equipped with four roof ventilation windows, a rain gutterpractical sliding door and boasting 7.22 m² this Greenhouse can accommodate a lot of plants. High-quality and sturdy greenhouse consistingof 4 mm strong anodized aluminium-profile and 4 mm strong,heat-insulting hollow chamber sheets. The folding roof windows ensure a perfect air circulation and with the practical gutter you might collect rain water for your garden & greenhouse. which guarantee advanced stability together with the reinforced wall and roof struts. 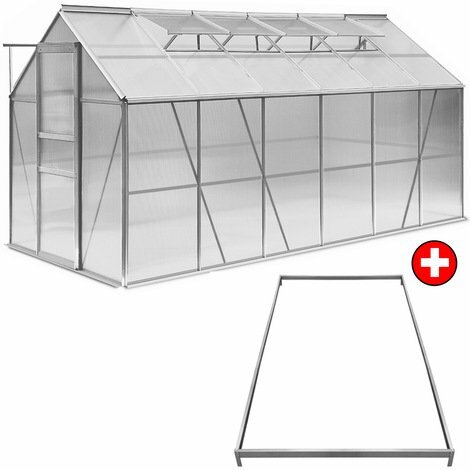 The base made of galvanized steel ensures additional stability and the best grounding option for your greenhouse. In addition the base prevents sinking of the greenhouse on an soft or soaked underground. Installation: The frame is fixed at the bottom withmetal hooks. The greenhouse and the frame are firmly connected withbrackets and screws.